Pros: An excellent young cast dazzle in this still relevant play about both being in your early twenties and the inequality of modern society. 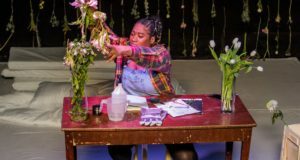 Cons: While the set contributes much to the atmosphere of the play, the actors are still finding their feet with the clutter and consequently it can sometimes act as a barrier rather than a tool. 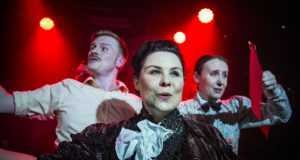 Our Verdict: Once again the Finborough produces great work, with a young cast we should watch out for, and a play almost as relevant today as twenty years ago. Hard Feelings was originally performed in 1982, and this production, at the ever glorious Finborough, is the first time London has seen the play since its run at the Bush in 1983. In many ways it’s become a period piece – a record of a time when Thatcher was on the radar but had yet to shape the country in such a divisive fashion. And yet it remains an accurate portrayal of the emotions and difficulties faced by hundreds and thousands of young people every year – the trials of living with people you like but don’t know well and the skills involved in balancing your new adult lives. Though the play has a political message, it has more force as a personal drama. The play centres around a flat, owned by Viv (or more accurately, her parents) and two university friends, Jane and Baz. Initially it seems like a happy set up, interrupted only by the frequent appearances of Viv’s unpleasant friends. Things deteriorate when Viv’s attitudes are challenged by Jane’s new boyfriend, and hostility slowly forces everyone to pick sides in a battle waged inside the small flat. It felt, in a lot of ways, that we were another one of Viv’s friends, crashing in the corner of the room. The sprawling set, filling the middle of the auditorium, was cluttered with all the paraphernalia of life – food, drink, clothes, books and many, many ashtrays. As the characters smoked and drank themselves into resentment, the audience lived and breathed the same air, as close to the cast as the other actors. You got a real sense of the claustrophobia these characters were experiencing and it was very unpleasant. I know a character is truly detestable when I feel myself tensing up every time they come on stage, and Viv is definitely one of those characters who can produce this reaction. She initially seemed silly but harmless, but because you could see so directly the way in which she was manipulating the truth and the outright lies she was telling, I found her incredibly unnerving. Do my friends behave like that? Am I being lied to by the obligatory housemates one has in ones twenties? I can only compliment the show for impacting me so personally! It’s often difficult for theatres to light such contained environments, but Will Evans’ subtle and, in places, very beautiful lighting was excellent. Likewise the music choices were top notch – any show with some Elvis Costello is going to go down well with me! Most importantly, perhaps, this young, fresh-faced cast all do excellent jobs and should be followed carefully – I suspect we’ll see a lot more of some of them. 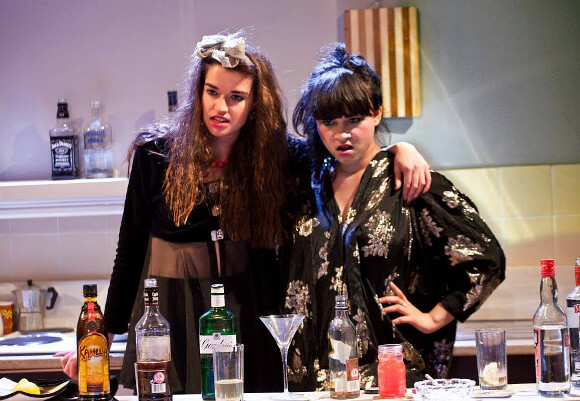 It’s hard in such an ensemble piece to pick anyone out, but Zora Bishop as Jane and Isabella Laughland as Viv beautifully show the transition from happy friendship to anger, hatred and mistrust in a way that was both infuriating (are you getting the impression of how much I disliked Viv?!) and moving. All in all, and excellent play, which has room to grow and change during the run, with some new actors to add to the ‘must follow’ list. Hard Feelings runs at Finborough Theatre until 6th July.